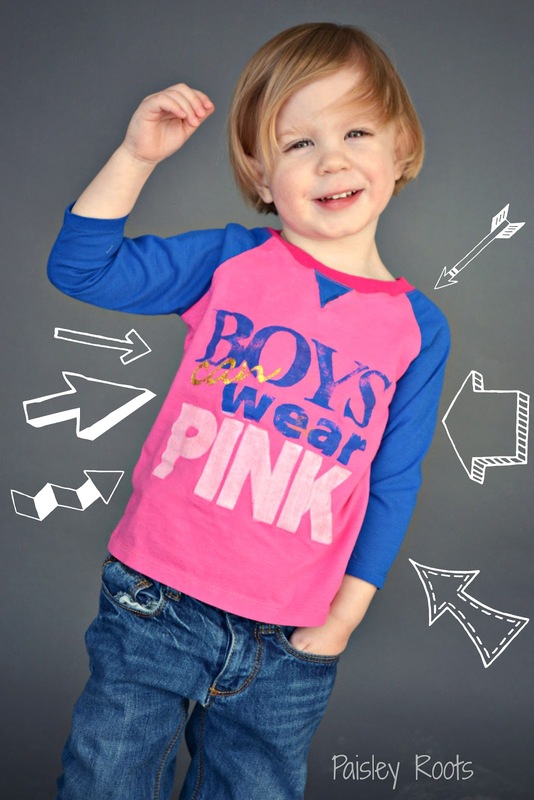 I'm so excited to be part of Handmade Boy's, "Boys Can Wear Pink" series! We just went through tons of Gavin's clothes and he has quite a few pink shirts, so I decided to make something for the child that needs clothes right now. Jude has grown so much! He's quite the little boy now! I used the Jolly Roger Raglan tee from Patterns For Pirates and decided to use Kelly's "Boys Can Wear Pink" stencil (you can go here to get that!) cause it's so cool! We were fresh out of yellow paint though, so he got sparkly gold paint instead! The jeans are from The Childrens Place. This kiddo will be getting many more "pink" items this summer. Which makes Jude jump for joy! Make sure to check out everyone else on the blog tour. There are so many amazing ways to incorporate pink in boys clothes! Don't forget to enter the giveaway too!!!! That shirt is awesome. Looks like it came straight out of a store. This is so perfect! I love the whole thing, including that gold paint. I love it so much! He looks so great in pink. He is a little charmer! He is so dang cute!!! Thanks for sewing for the series!! The pink together with the blue is sooo good. And his eyes - beautiful! Plus i love that stencil! Oh my gosh, this outfit is adorable and so is Jude! Love it! That looks fabulous! My very manly nephew is a pink for boys advocate! This is such a killer shirt- I couldnt' believe when I realized it wasn't upcycled. Really great work mamma, you are always one to impress!! !